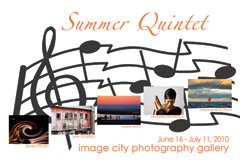 We kick off our summer season with Summer Quintet, an exhibit that features work by five local, accomplished photographers. Each presents a portfolio of their work: Matthias Boettrich with Close to Home, Daniel P. Crozet with Curves, Michelle Macirella with In the Moment, Martin Nott with Waterscapes, and John C. Solberg with Potpourri. The wonderful selections of their art takes us to the abstract, the natural, the scenic, and even to appreciate what the cat brought home. Steve Tryon's exhibit is in the East Gallery. Marty and Daniel have each produced short YouTube videos of selections of their work in the exhibit; check them out by clicking on their name with the link above. The guest photographers exhibiting are Brian Calvasina, Karen Craft, Kim Denman, Clay Gehring, and David P. Somers. Award-winning photographers from Camera Rochester competitions are Wendy Cohen, Bob Hinkelman, Jeno Horvath, Jerome Kaye, Alex Pendleton and David Ridley. We round out the show with work by Artists-in-Residence Jim Patton and David Perlman as well as by Gallery Partners Joel Krenis, Steve Levinson, Gil Maker, Don Menges, Dan Neuberger, Betsy Phillips, Gary Thompson, Phyllis Thompson, Sheridan Vincent, and George Wallace. Note July 2 is First Friday Gallery Night, Image City is open until 9pm. Peter Marr has reviewed all of the photographs in the show and has picked five of his favorites from the photographs by the featured and guest photographers in Summer Quintet. For each of "Peter's Picks" he writes a review, and we have excerpts from his discussion here in the newsletter. You will want to go to the webpage link to see larger images and the full write-up, or, even better, be sure to visit the gallery to see them in person. 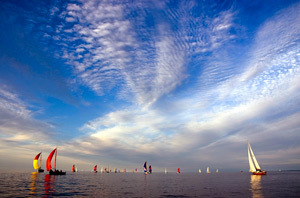 For the first pick, Peter chose Sailing Lake Ontario by Matthias Boettrich commenting "It is to the photographer's great credit that he has artistically given the sky and the clouds, ninety percent of the print, for by themselves, the clouds would have made a great photograph. Coupled with the majestic and impressive boat formations, and the sails displaying a wonderful range of vibrant colors, the end-result is just spectacular..... How fortunate it was for the author to be sailing on the lake, and being presented with this incredible scene. What is truly outstanding, is that the photographer took this opportunity to record this memorable scenic in such a sublime and artistic manner." Peter next chose Curious by Brian Calvasina writing "These poignant, often heart-wrenching images of scenes from a war-torn country, are powerful and dramatic...... 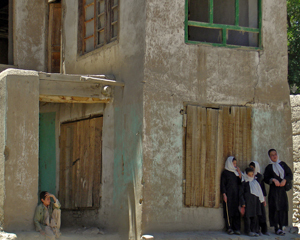 The real beauty of this image is that, yes, it is a peaceful scene in a war-torn country, but my thoughts are not on the present, but on the future. This print evokes a hope that sometime in the future there will be peace, and love and companionship will prevail, and these children will have a more promising life ahead. This is an enigmatic, compelling image, beautifully and artistically seen and captured. 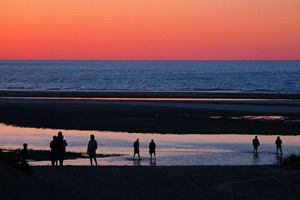 In Martin Nott's Cape Cod Sand Flats, Peter noted that "Certainly, this first-rate seascape also enlightens us with a human story of people enjoying every moment of a lovely evening, whilst paddling in the warm water with friends and family. The enhanced hues are dramatic, and I love the slim, sliver of golden light that illuminates a strip of sand in the center of the image, effectively breaking up the large, dark area of sand in a very pleasing manner. This is not just an exercise in viewing a series of colorful rectangles. It is a very imaginative, elegant, and creatively seen and printed image, of a breathtaking scenic, that everyone of us would have loved to have been a part. This is a great example of design and color used expressively and creatively." 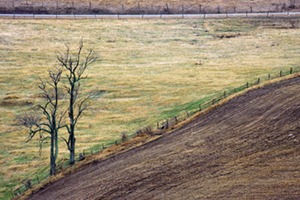 In choosing the photograph by John C. Solberg, Peter observed "In Standing Watch, we experience a wonderful landscape that expresses the passage of time with serene eloquence. Here we have soft, warm colors, textures that move and effortlessly blend, dramatic lines, and a powerful tension for all of us to visualize, study, and contemplate. Here, we have a vista that we know is part of a larger scene, superbly captured for all to enjoy..... It is our challenge to not only enjoy the artistic beauty that we see here, but to immerse our own thoughts as to what allure and appeal lies beyond the road and fences." With David P. Somers' Snow on Jackson Road Farm, and his fifth selection Peter writes, "Certainly, the farm and building are very picturesque in most lighting situations, but the framing, camera position and the delightful snow are just impeccable. What truly makes this panoramic so outstanding is the gorgeous lighting, which highlights every detail and color to perfection. Especially important are the shadows in the foreground, which cast intricate patterns that are just fascinating, and give a wonderful base to support the rest of the scene. Snow usually evokes feelings of cold and despair in some, but this delightful panoramic is warm and inviting. You feel that this pristine scene should never be violated by even a single footprint, entrance should only be in the rear, so that nothing can mar this exquisite image. We hope that you can see from Peter's selections that the exhibit Summer Quintet has an engaging range of thought-provoking photographs. We appreciate his skill in describing what appealed to him in making his selections. It is a true compliment to the efforts of the artists' portfolios. We hope that Peter's Picks will be an additional enticement for you to attend the show, admire the talent and potentially invest in the work of the artists. There is much more that will, we suspect, attract you to want to visit to see the full exhibition! Over the years Gallery visitors have asked us for places they could go to participate in image critiquing. Of course we have always offered to critique images as individuals have stopped into the Gallery and asked, but many are concerned that larger group discussion might be too intimidating. Image City Critiques is a new free program we are going to offer at the Gallery providing participants an opportunity to critique and be critiqued in a friendly, constructive, positive environment. We had a good session during the kickoff in May and June. The next session is Wednesday, July 7th from 7:00-9:00 pm and we will consistently hold the Critiques on the first Wednesday of each month as long as there are participants. If you'd like to join us, please bring 2 or 3 jpg images that are at most 1MB in size and at most 1500 pixels on the longest side. You may also bring them as a print, on a CD, or on a thumb drive. If you have any questions please contact Don Menges (dmenges@rochester.rr.com) or Gil Maker (gmaker@mac.com). We look forward to meeting with you on July 7at 7pm. Last month I wrote about using lupines in a foreground with a fog enshrouded harbor as a background. I called this the 2-F perspective - Fog and Foreground. This month I would like to introduce the "Total Fog Perspective." Total Fog images are those where the subject is completely immersed in fog. To capture Total Fog images I often use my 100-400 lens, locked on a heavy tripod, use mirror lock-up with a cable release, and then scan a heavy fog scene for interesting subject matter. I try to isolate interesting subjects that are totally immersed in the fog. The fog will have varying effects on subjects that are at different distances away. Close objects will be sharper than farther away objects. As the distance becomes greater objects increasingly become softer and more muted. The different densities of fog create a feeling of depth. Commercial fog filters and the old fashioned method of blowing hot moist breathe over the front of a cold lens generally don't work because they render all parts of an image equally soft throughout, thereby losing depth perception. Mother Nature's fog is the only really natural looking "fog filter". In this month's example image entitled Boats in the Fog, I photographed the scene about fifteen minutes after last month's Tip of the Month picture. 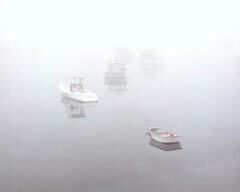 My subject matter is a group of boats positioned in the fog at different distances away. How many boats are present? If you said four, you are good. If you counted five you are really, really good. If you counted six you have an excellent imagination or you have found a new boat. I overexpose fog images by about 1.5 stops using matrix metering and bracket a half stop each way. Total Fog images tend to be very artistic, moody and mysterious, whereas 2F images tend to be more dramatic, moody in a different way, and with a better feel for depth. When you have the great light of a foggy day shoot many images using both perspectives. Click Here to see a larger image of Boats in Fog and to review the other photographs in the series and the tips Gary has written. We are very pleased at the response from our Call for Submissions for the upcoming Portfolio Showcase 2010. We had more than 100 submitted entries. The jurors for the exhibit, William Edwards, Dan Neuberger, Brian Oglesbee, and Gary Thompson, are currently working hard to evaluate all of the portfolios to make the final selection of the winning eight portfolios. Image City and sponsors Lumiere Photo and PixelPreserve are looking forward to producing another Portfolio Showcase exhibit and the limited- edition, high-quality show catalog - having all photographs from the winning portfolios - specially designed and produced by PixelPreserve. The Portfolio Showcase 2010 exhibit at Image City will open on August 11 with the reception and award presentations on August 13. July 7, 2010 Image City Critiques begins at 7pm at the Gallery.